Wildflowers are tough enough to withstand trying conditions, yet bold enough to attract the pollinators they need to reproduce. Wildflowers are tough enough to withstand trying conditions, yet bold enough to attract the pollinators they need to reproduce. 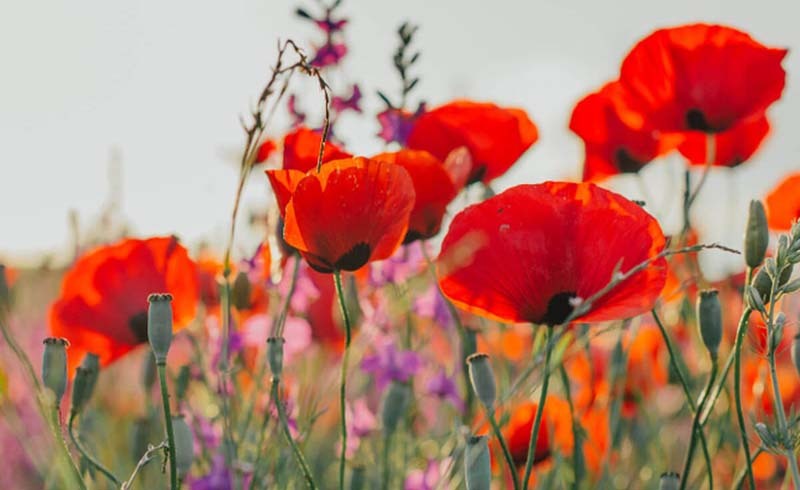 Try some of these standout wildflowers in your home garden. Like many wildflowers, larkspur (Consolida ajacis) is an annual that might have you believing it’s a perennial. It shoots up in spring, showing off ferny foliage and bright spikes of blue-purple, pink or white. By midsummer this cool-season annual is fading and ready to be cut back or removed. A rampant self-seeder, it comes back year after year, slowly drifting around the garden. Don’t worry; young plants are easy to remove and it’s not a pest. 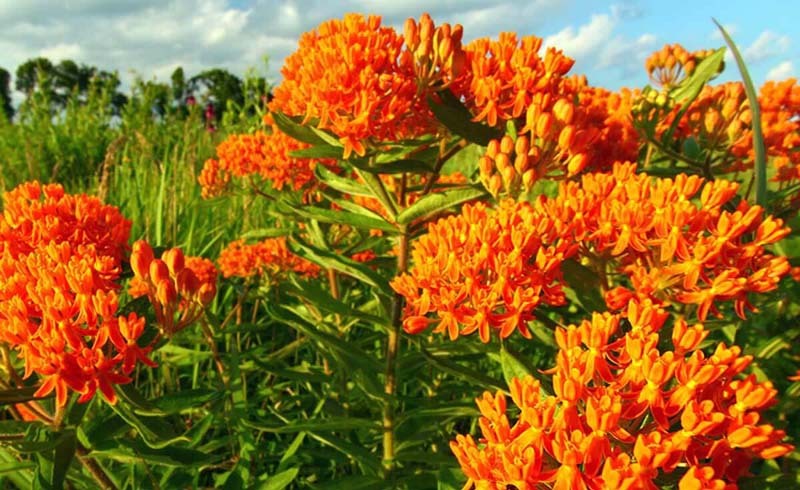 Frank Sinatra is quoted as saying “orange is the happiest color.” One look at the bright blooms of this butterflyweed (Asclepias tuberosa) and you can see why. It’s also the happiest flower for butterfly lovers, who will delight in seeing the blooms become a magnet for their favorite pollinators in midsummer. A drought-tolerant wildflower, butterflyweed makes a splash in any garden. It’s perennial in Zones 4–9. 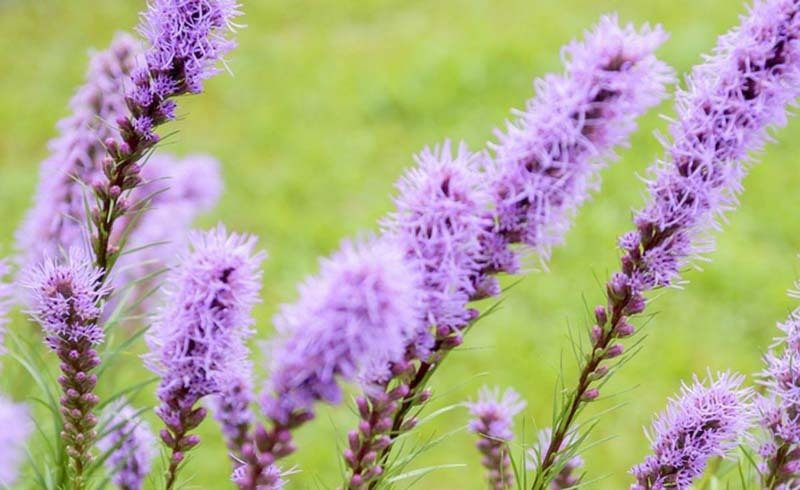 Liatris spicata, also known as blazing star or gayfeather, is a proud prairie plant with a tough disposition suited to its heritage. A bulbous perennial, its grasy foliage looks right at home growing with tall grasses. But in summer, the bright purple flower spikes are a real treat that no grass can compare with. The spikes make a good cut-flower, and the plant itself is drought-tolerant and deer-resistant. It is hardy in Zones 3–9. Field poppies (Papaver rhoeas) go by a number of names: corn poppies, Shirley poppies, Flanders poppies, and red poppies. They are the famous annuals that miraculously appeared in battle-scarred fields immediately following World War I. That in itself should tell you a thing or two about the tenacity of these plants. They self-seed easily and will fill up as much space as you allow them to. But they’re far from being garden thugs and you will be happy to have them around—even after the flowers fade, due to the ornamental seedpods. 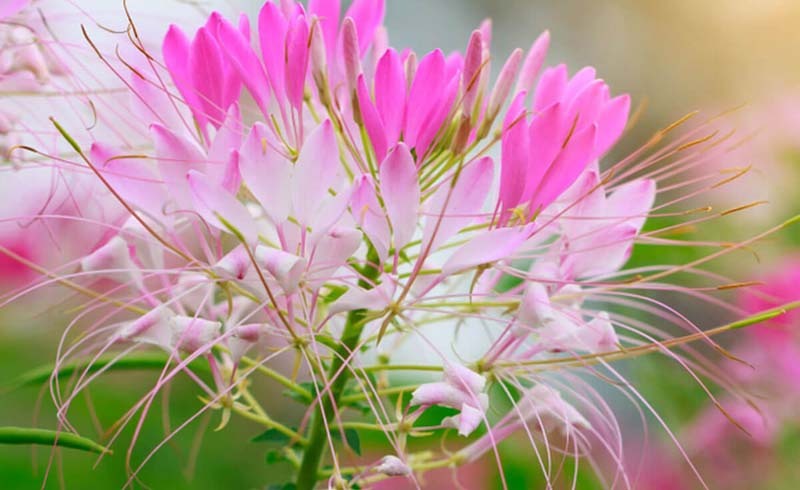 Cleome, sometimes called spiderflower because of the spiderlike flowers, is an unmistakable annual in the wildflower garden. It grows quickly from seed, towering up to 4 or 5 feet and offering fragrant pink, purple or white bicolored flowers. 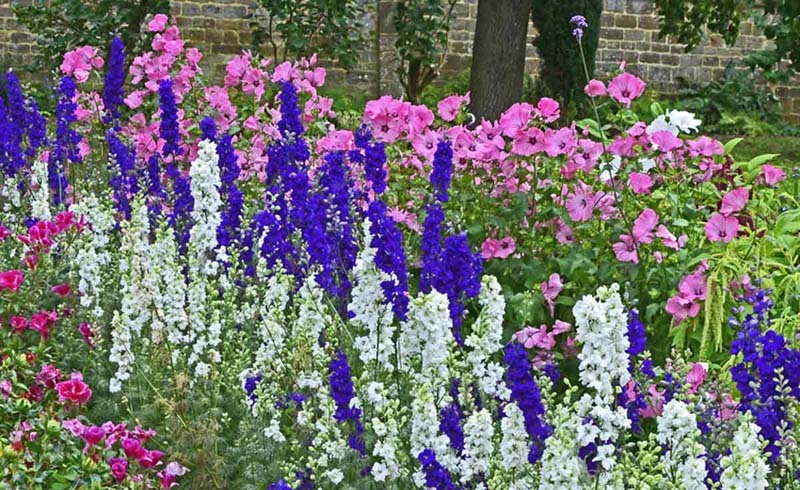 Meet some more fragrant plants. A pollinator favorite, it is drought-tolerant and the sticky stems foliage are left alone by browsing animals. Cosmos’ beautiful lacy foliage is reason enough to grow this annual wildflower, but the bright daisylike flowers are another huge incentive. 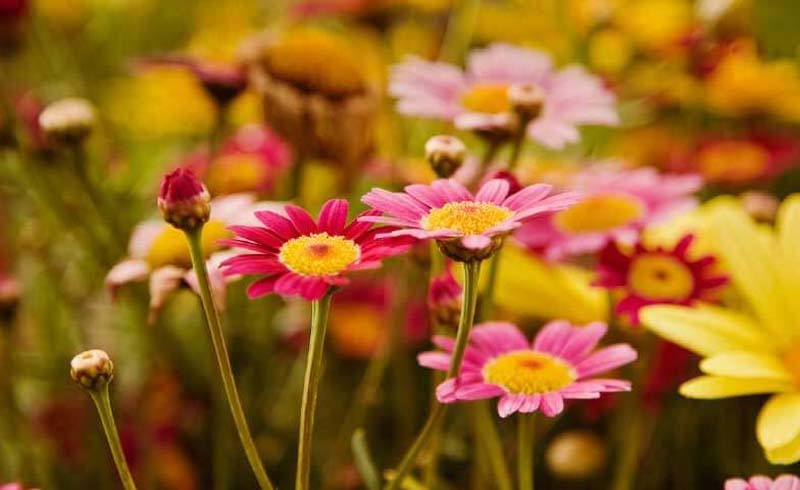 The silky flowers come in hues of white, pink, red, orange, yellow and gold. 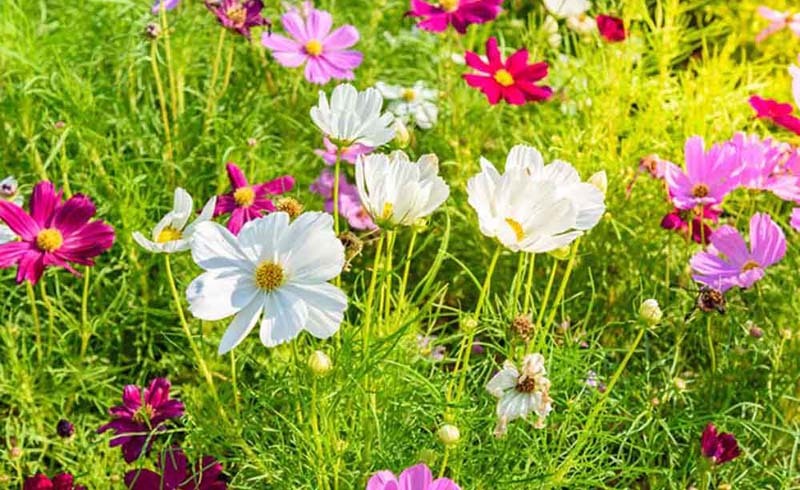 Cosmos reaches 1 to 3 feet and flourishes in hot, dry conditions—once plants have established themselves. Really, any sunflower will do well in the home garden, but the tall annual sunflowers do look a bit past prime once they’re finished blooming. 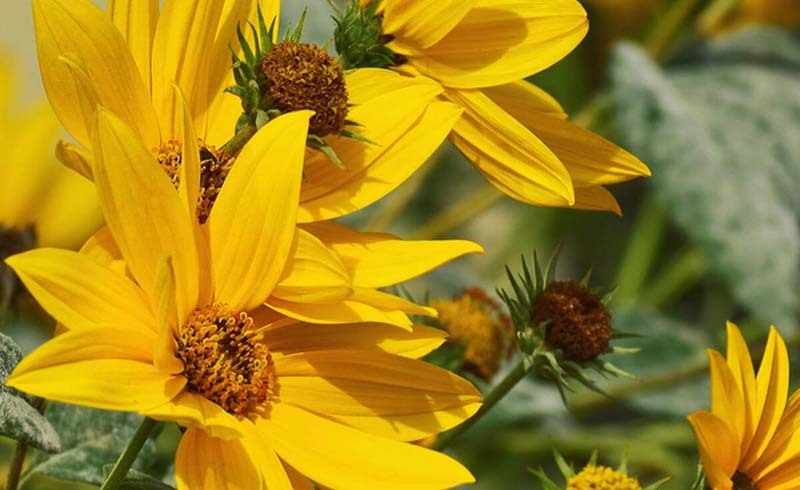 Perennial sunflowers, such as Maximilian sunflower (Helianthus maximiliana) tend to keep their lanky good looks longer into the season. Plus they come back year after year. 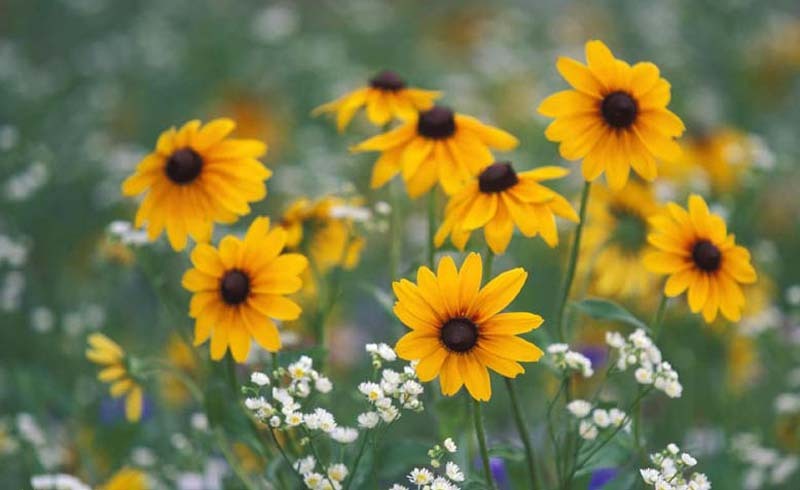 Maximilian sunflower grows 6 to 10 feet tall, so use it as a back-of-border plant or privacy screen. It blooms in late summer and is hardy in Zones 4–9. 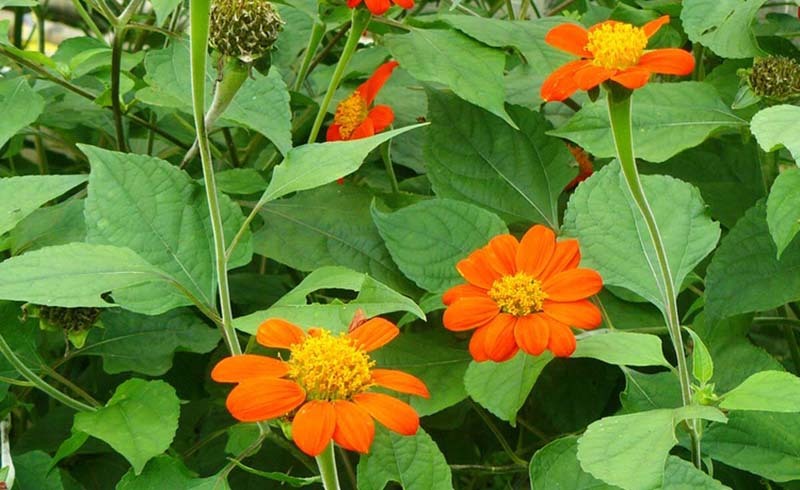 Like its unrelated namesake, Mexican sunflower (Tithonia spp.) is exceedingly easy to raise from seed. In a sunny spot with good drainage, you can have 3 to 4 foot tall flowers in a matter of months. Keep them deadheaded and they’ll bloom all summer. The bright orange flowers are a butterfly and bee magnet, but be sure to let some go to seed in fall to feed the birds (as they peck, some seeds spill on the ground to bring another crop next year). 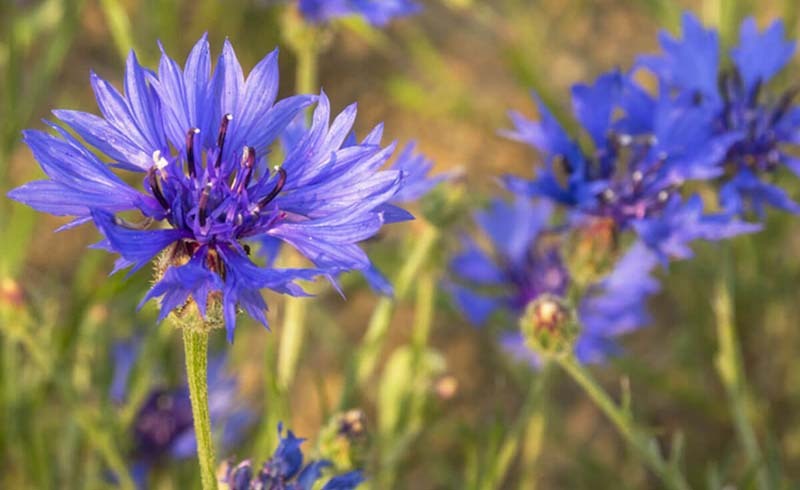 These easygoing wildflowers, also known as cornflowers, add an unusual color to the garden in early summer. The rounded, fluffy blue flowers are prolific, but bachelor’s buttons (Centaurea cyanus) must be religiously deadheaded if you want them to make it through summer. Otherwise, the whole plant withers and goes to seed, practically begging to be pulled. It’s a rampant self-seeder, but unwanted seedlings are easily removed. Some cultivars have white or pink blooms, but why grow those common colors when you can have the extraordinary hue of blue?! Bee balm (Monarda didyma), also called Oswego tea for the region of New York State where it was discovered, is a pretty perennial and medicinal herb rolled up into one. It grows in sun or part shade and doesn’t attract deer. Fortunately, the same cannot be said of bees, butterflies and hummingbirds. As you might guess from the common name, it is a pollinator favorite. Meet some more bee-friendly flowers. 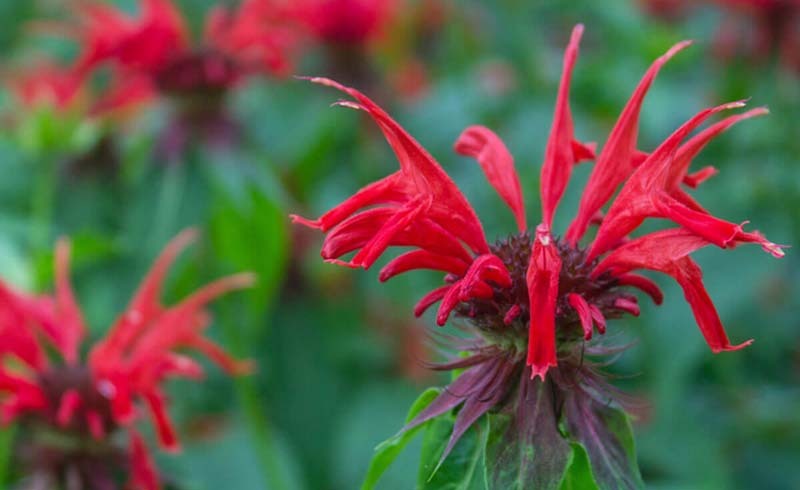 Bee balm comes with red, pink or purple flowers and is hardy in Zones 4–8.